Yoga guru Baba Ramdev on 14 June 'did some wrestling practice and tought yoga' to two-time Olympic medallist Sushil Kumar and other wrestlers at the Chhatrasal Stadium, here in the national capital. Ramdev took to his official Twitter handle to share the pictures of him performing yoga with the wrestlers. In one of the two pictures, the yoga guru can be seen lifting Sushil Kumar on his shoulder. "Did some wrestling practice and taught some yoga to Olympian @WrestlerSushil and other wrestlers at Chhatrasal stadium," tweeted Ramdev. Ahead of the celebration of this year's International Yoga day, Ramdev has appealed everyone to come out their houses and perform yoga. Talking to ANI, he described the importance and benefits of the performing arts. 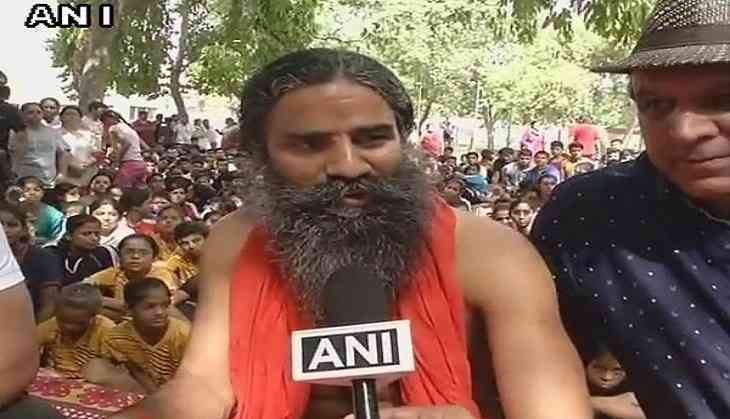 "I would appeal everyone to come out and perform yoga on the yoga day (June 21). Modi ji will be in Lucknow and I will be in Ahmedabad.Yoga is compulsory for all professionals. Yoga gives you fitness, sharp memory and boosts your confidence. Hence, it is very important exercise for a human being," he added. The International Yoga Day would soon commemorate its 3rd anniversary ever since its inception on June21, 2015. Prime Minister Narendra Modi had initially proposed the idea during his UNGA speech on September 27, 2014.